Nela Park, located along Noble Road in East Cleveland seven miles east of downtown Cleveland, was the world's first industrial park. 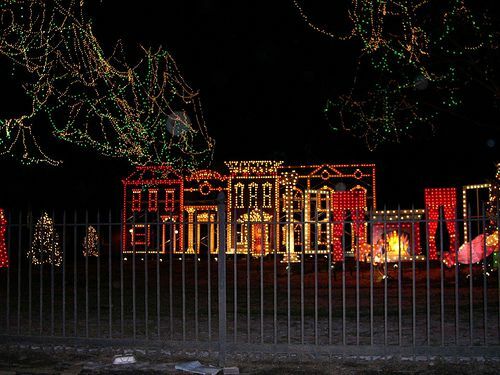 Today, the 92-acre campus is home to General Electric's Lighting Division and employs around 1,200, and the facility has become known for its gracious Georgian-style architecture and its spectacular holiday lighting display. However, in June of 2017, General Electric announced it would soon be putting Nela Park up for sale, so if you're planning to visit this piece of innovative history, this holiday season may be your last opportunity to witness the fantastic lighting display for Christmas. Although you can no longer drive through the industrial park itself during this holiday display and showrooms are viewable by appointment only, the views from the road during Christmas are still spectacular. Nela Park was established in 1911 when General Electric bought an abandoned vineyard seven miles from Cleveland in what was then the rural countryside. The facility is named for the Cleveland company—National Electric Lamp Company—that was acquired by GE in 1900 in an effort to standardize the size of light bulb bases. Nela Park was designated a National Historic Place in 1975. The Nela Park campus consists of 20 Georgian Revival-style buildings, all but four of which were built before 1921. These early buildings were all designed by the New York architectural firm of Wallis and Goodwillie. The facility is also known for its art collection, which includes a number of Norman Rockwell paintings. The Institute at Nela Park was established in 1933 as the first higher education center in the United States specifically geared toward teaching students lighting, and the Institute now plays host to over 6,000 students a year who want to learn more about this scientific career path. Today, Nela Park is the world headquarters for General Electric's Lighting Division—one of the company's seven divisions; the company, founded by the merging of Thomas Edison's Edison Electric Company and the Thomson Houston Company in 1892, has grown to become the world's second-largest corporation. Among Nela Park's many functions is education. The facility hosts a full schedule of seminars for end users, contractors, and lighting distributors. In addition, Nela Park houses commercial, office, and industrial lighting showcases and other lighting design showrooms; however, Nela Park is not open to the general public and the showrooms are open by appointment only. One of the most popular aspects of Nela Park is its annual holiday lighting display where the facility decorates the campus along Noble Road with thousands of lights for visitors to enjoy from early December until New Year's Day. Although holiday visitors are no longer permitted to drive through the campus (for security reasons), the beautiful holiday lights can be viewed from the street. The manufacturing facility at Nela Park also makes and donates the lights and ornaments for the National Christmas Tree on the White House lawn in Washington D.C., a function it has performed since 1922.